Here's an example of the classic Twitter profile page. The experience of Twitter has changed little since it first launched in the summer of 2007. Tweets are still capped at 140 characters and many of Twitter's core features -- hashtags, @replies, direct messages, favorites and retweets -- have been around since the early days. The design has gotten prettier and more intuitive over the years. Rich media in the form of images and video are now embedded within the tweets that appear in users' timelines. Twitter's mobile and online applications have also been updated over the years to amplify and notify users of the more relevant conversations taking place on the platform. But until earlier this year, the profile page that acts as a stand-in homepage for all 255 million monthly active users saw little development. In what is arguably the company's biggest and most important redesign to date, Twitter has done a complete overhaul of user profile pages and made the new features available to all users last week. Dan Greene, senior director of U.S. online sales and operations at Twitter, highlights three features of the new profile -- a media-forward layout, pinned tweets and the enlarged display of each user's most engaging content -- that will help brands better connect with their customers. While the features are no different than what's available on other social platforms, the redesign does give Twitter a more modern look while possibly reflecting even more about the company's vision going forward. Nonetheless, this refresh was long overdue. Now that Twitter's new profiles are here, brands and users should familiarize themselves with the latest changes and determine how to make the most of their new home on Twitter. It's always cool to be an early adopter or special beta tester, but it can be downright embarrassing if you arrive too late for the party. The most obvious and drastic changes are on display in the layout of users' tweets, photos, videos, favorites and other lists. In a homage to Pinterest, perhaps an unintentional one, Twitter organizes tweets, activity and visual content into a grid. You can also pin any tweet of your choosing to the top of your page, the first of what could be many more moves away from Twitter's reverse-chronological infrastructure. With that fresh design in mind, these are the top changes and tips you should be aware of the next time you use Twitter online. "Make sure your new profile page accurately reflects your brand's unique personality and voice," Greene writes in response to questions. "Each aspect of your profile, including the pinned tweet, header photo, and bio, is an opportunity to humanize your brand and connect with your customers on a deeper level in real time." Profile photos and header images get major real estate in your new Twitter page and this is where the inevitable Facebook comparisons come around. User photos have been bumped to 400-by-400 pixels and the header image, which now spans the entire browser, carries a recommendation size of 1500-by-500 pixels. Existing images should scale to the new size, but users are encouraged to upload higher-resolution images to provide the best visual experience possible. To change your photo or header image, go to Settings > Profile and select "Change photo" or "Change header." You can also make these changes to you profile, including others, directly from their profile page that can be accessed by selecting the "Me" tab at the top of the page. 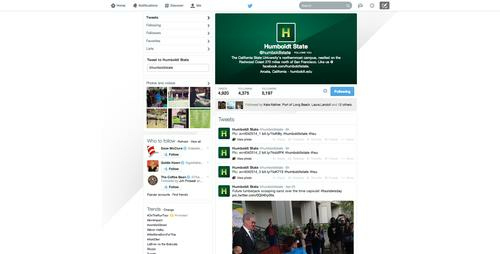 Twitter has also elevated the importance of more engaging tweets in the redesign. Tweets that generate more activity in the form of retweets, favorites and @replies now appear slightly larger in your feed. It's a simple way to make your best content easy to find, Twitter says about the change. "If you're having trouble figuring out what to tweet, plan for marketing moments that happen everyday or during big events like holidays or awards shows by preparing your visual assets ahead of time," says Greene. "Don't underestimate the value of a well thought out content calendar to help streamline your brand's Twitter content strategy." If you still feel like one of your tweets is not getting the respect it deserves, now you can pin it to the top of your profile page. Pick wisely though and try to keep things fresh because you can only pin one tweet a time. Greene describes pinned tweets as a "valuable tool that enables brands to highlight their best content -- like a Twitter exclusive promotion, a coupon code or a featured contest winner -- at the top of your profile." Brands and marketers are already using this feature to promote their most recent news, offers and other content they find to be most relevant for their followers. To pin your best tweet to the top of your page, find which tweet you'd like to bring to the top, click on the More/share button at the bottom right of your tweet and select "Pin to your profile page." Twitter is also surfacing more data to better organize how tweets from a single user are displayed to others. Now when you visit other profiles, you can filter their tweets based on the type of engagement or content you're seeking out. Tweets can be viewed alone or with replies, providing deeper insights and metrics into the level of engagement each user is generating. Tweets that contain photos or videos can also be organized into a single view. Twitter should be rolling out the new profile pages to all users over the coming weeks, but if you still have the classic look and would like to make the switch now you can do so at this page that details the changes.